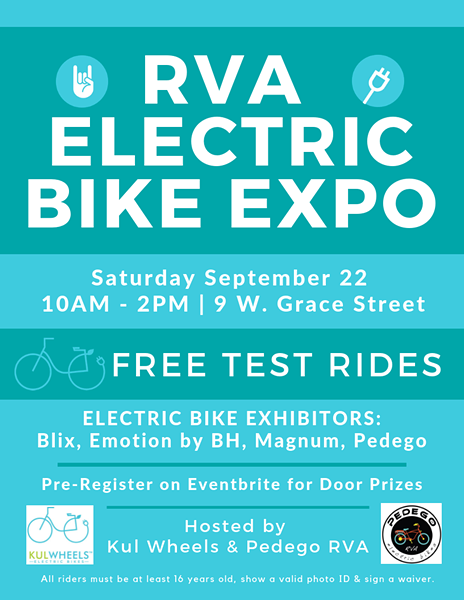 RVA Electric Bike Expo | 9WG Studios | Happenings | Style Weekly - Richmond, VA local news, arts, and events. As a way to promote electric bike awareness in Richmond, Kul Wheels along with Pedego RVA are holding the firs RVA Electric Bike Expo on Saturday, Sept. 22, from 10 a.m - 2 p.m. at 9 W. Grace St. People can test, compare and learn about multiple electric bikes including beach cruisers, commuters and mountain bikes. Exhibitors will include Blix, Emotion by BH, Magnum and Pedego. Door prize will be awarded. All riders must be at least 16 years old with a valid picture ID. Price: Free but pre-registration is recommended.